For latest news, please visit the news page. Welcome to one of the most exciting open source software developments in the embedded software world since GNU created GDB. OVP: Fast Simulation, Free open source models, Public APIs: Open Virtual Platforms. If you are developing embedded software then virtual platforms will be increasingly important to you - especially if you are working on designs with more than one processor - then this OVP website and OVP technology will become an important resource for you. Research has shown that virtual platform technologies enable the adoption of Continuous Integration to streamline the process of developing embedded software. The combination of Continuous Integration and Virtual Platforms allows the creation of development environents that can provide higher quality embedded software to be developed in shorter timescales. Please do take the time to browse the different pages and come back and visit as we add more information, technology, documents, and very importantly make sure you go to the download area and take a look at all the different capabilities and models being offered for free by this community. Download one of the simpler platforms into your PC and see how your embedded software development environment can run 100s of MIPS, often faster than real time. 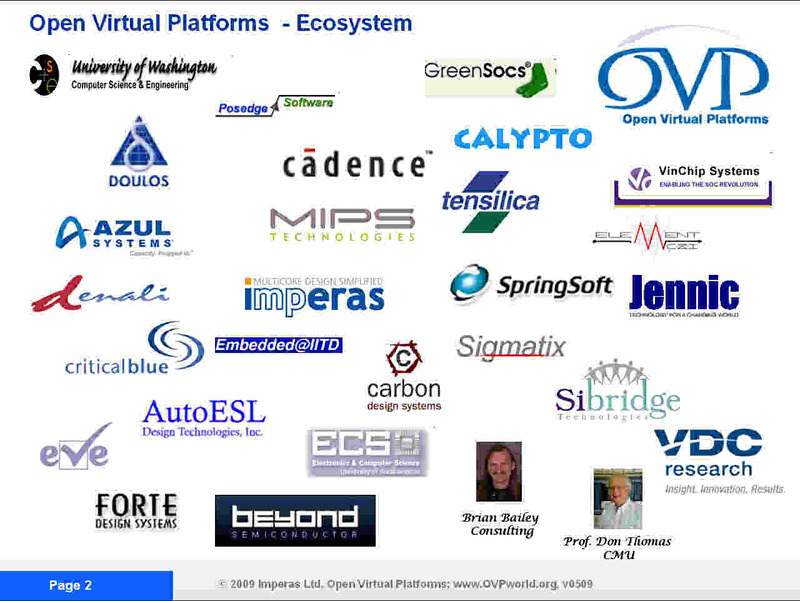 Imperas and others announced OVP in March 2008 and have since put the OVPsim™ simulator, full documentation, and examples / demos and processor models on this site - ARM, Imagination MIPS, Synopsys ARC, Renesas v850 / RH850 / RL78 / M16C, openCores OR1K, PowerPC, Altera Nios II, Xilinx MicroBlaze, RISC-V, single core, multicore, manycore, C, C++, SystemC, TLM2 etc. Imperas and others have put many of the processor and peripheral models into open source and made them available on this site on the download and library pages - please start to use the simulator and modeling technology with the existing models and keep coming back and have a look at how OVP progresses. If you want to help out - please email us. The first addition is the Open Platforms (OP) API that allows virtual platforms to be defined and controlled very simply with a very powerful C API that allows the modeling of hierarchical systems. OP also enables the creation of test benches and harnesses to precisely control these hierarchical, often many processor systems. The second is iGen™ which is an Imperas platform/model building wizard. iGen uses a simple input script and creates the C files that describe a platform using the OP API. iGen not only creates platforms in C, but also creates C++/SystemC/TLM2 platforms. iGen is also used for creating behavioral peripheral components. eGui™ and iGui™ are graphical debug interfaces to allow GUI based source code debug of virtual platforms and embedded software. iGui is a very easy to use, very efficient GUI that encapsulates GDB and provides easy access to embedded software debug. eGui is an advanced debugger based on the the very popular Eclipse IDE. OVP downloads now include the Instruction Set Simulator (ISS) and Harness. ISS is a program that allows you to run compiled binary embedded software elf files on specific embedded processor variants without the need to develop a virtual platform. ISS comes with the choice of over 200 embedded processor cores. The Harness program enables simulation of virtual platforms without the need to create a test harness or test bench. To read about the rationale behind OVP please go here. To learn about the technology go here. What is OVP? - It is simulation to develop software on: Fast Simulation, Free open source models, Easy to use! Imperas™ developed some fantastic virtual platform and modeling technology to enable simulating embedded systems running real application code. These simulations run at speeds of 100s and 100s of MIPS on typical desktop PCs and are completely Instruction Accurate and model the whole system. Imperas decided to open up this technology and OVP is the vehicle to make it public. OVP has three main components - the OVP APIs that enable a C model to be written, a library of free open source processor and peripheral models, and OVPsim a fast, easy to download and use simulator that executes these models. There is also the iGen Model Building Wizard that is part of the OVP download and makes it easy to create platforms and models. With OVP you can put together a simulation model of a platform, compile it to an executable, and connect it to your debugger to provide a very efficient fast embedded software development environment. If you want more information on OVP - please see the forum - or please email us. OVP™, OVPsim™, iGen™, iGui™, eGui™, Open Virtual Platforms™, and Imperas™ are trademarks of Imperas Software Limited.